The suburban Calgary office environment continues to face stiff vacancy challenges after the recession years of 2015-’16, but entrepreneurs are finding niches to bring new product to market. The Royal Vista centre, being developed by the Prime Real Estate Group and marketed by Barclay Street, consists of two phases. The first, called Building B, is currently under construction and offers 5,500 square feet of office space on the second floor. It will be available to tenants this summer. Retail space at street level of up to 2,800 square feet is being marketed by the Taurus Property Group. Building A, which will be situated next door on the site at 4 Royal Vista Way N.W., will comprise three floors of almost 48,000 square feet, or just under 16,000 square feet per floor. Construction of that space will be triggered by leasing activity. “We definitely have interest in Building B and we have interest in Building A,” said Rundle. “We have good groups that are looking at it . . . two to three groups in a variety of different sizes. “From the time we strike a deal in Building A, we believe we can have occupancies within 18 months. We’re marketing that and we’ll move very quickly upon lease execution. What’s wonderful about this building, which is different from other nodes in the city, is that it’s got a smaller floor plate. Anthony Scott, director of research with Barclay Street, said the first-quarter vacancy rate in Calgary’s suburban office market was 17.7 per cent. By quadrant, it was: 13.02 per cent in the northwest; 21.48 per cent in the northeast; 14.6 per cent in the southwest; and 18.93 per cent in the southeast. Due to a reassessment of inventory and tracking methods, Scott said those figures can’t be compared to previous vacancy rates. However, he said the suburban markets appear to have stabilized. “From our perspective, the suburban markets appear to have calmed down substantially, as seen over the previous few quarters when vacancy changes were muted. We have every reason to believe this quarter is no different,” said Scott. The overall suburban vacancy rate for Q1 2017 was 22.9 per cent and at year-end it was back at the same level, having risen slightly during the intervening quarters. Other than Royal Vista, there are two other suburban office construction projects ongoing in Calgary, according to Scott. The Macleod Professional Centre is just over 31,000 square feet and should be available by June. The medical-focused facility, at Macleod Trail and 39th Avenue, is being leased by the Opus Corporation. The 160,000-square-foot Hexagon Calgary Campus, which is being purpose-built for its occupier, is expected to be completed in early 2019. 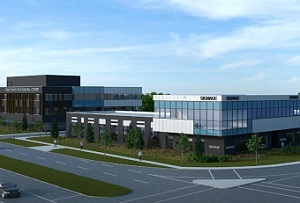 The Royal Vista Professional Centre II is located within the Royal Vista Business Park in the northwest community of Royal Oak, one of the city’s most populous and quickly developing communities. “There’s kind of a lack of professional services in the northwest and we feel that a development like this is well-located to help meet the need of a growing demand in what is an under-serviced market,” said Rundle. “We are seeing increased activity going into Q2 (in the suburban office market). Barclay Street says the Royal Vista Business Park has direct connections to many of Calgary’s most important transportation arteries. It’s minutes away from the Calgary International Airport, Foothills Hospital, and the University of Calgary. The business park is also close to many retail amenities. It’s located next door to Royal Oak Shopping Centre and within 10 minutes of three regional shopping centres. The marketing brochure for the Royal Vista Professional Centre says developer Prime Real Estate Group focuses on providing project planning, development, construction, leasing and asset management services to projects throughout North America. It is currently developing and managing projects of more than two million square feet, including business park sub-divisions, retail shopping centres, suburban office buildings, mixed-use commercial centres and industrial bays. Prime’s projects owned and under construction have a current retail value of more than $250 million. Its primary projects are located in Western Canada and the Greater Houston Area. Calgary, Edmonton sublease space dips; has office turned corner?